An Asian pear is a fruit from the tree with the scientific name Pyrus pyrifolia. The Asian pear tree is native to Asia and has other names such as the nashi pear, sand pear and apple pear. The fruit has a high water content and a grainy texture compared to the familiar European pear. NutritionData provides nutritional data for Asian pears. This information applies to a single raw fruit about 2 ¼-inches high and 2 ¼-inches in diameter. 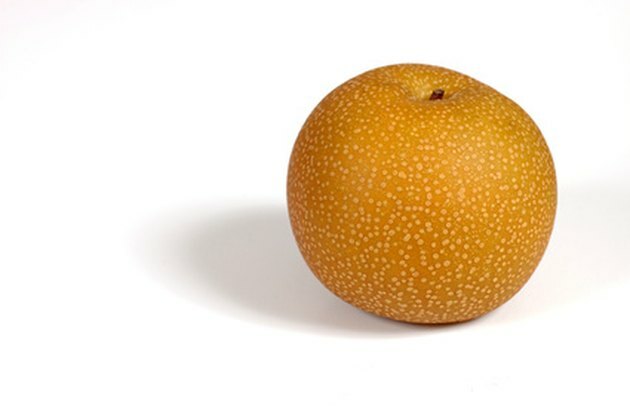 An Asia pear typically provides 122g, or about 4.4 ounces of edible flesh. An Asian pear contains approximately 51 total calories. Carbohydrates account for 47 calories, fat contributes 2 calories and protein provides the remaining 2 calories. An Asian pear provides 3 percent of the daily value (DV) for total calories based on a diet of 2,000 calories per day. An Asian pear has 13g of total carbohydrates. Simple sugars provide 9g of this total and dietary fiber accounts for the remaining 4g. An Asian pear has 4 percent of the DV for total carbohydrates and 18 percent of the DV for dietary fiber. An Asian pear doesn’t have any complex carbohydrates. An Asian pear contains 0.3g of fat, or less than 1 percent of the DV for fat. It doesn’t have any unsaturated fats, trans fats or cholesterol. An Asian pear also contains 0.6g of protein, which is slightly more than 1 percent of the DV for protein. An Asian pear contains 8 percent of the DV for vitamin C, 7 percent of the DV for vitamin K and 2 percent of the DV for folate. It also has 4 percent of the DV for potassium, 4 percent of the DV for manganese, 3 percent of the DV for copper and 2 percent of the DV for magnesium. An Asian pear provides 1 percent or less of the DV for all other vitamins and minerals.